Train No.09309 Kochuveli – Indore superfast special fare special train will leave Kochuveli at 11.00 hrs. on 25-12-2015 & 01-01-2016 and reach Indore at 05.15 hrs. the third day. Composition: AC 2-tier – 2, AC 3-tier – 3 & Sleeper Class – 8 coaches. Stoppages: Kollam, Kayankulam, Alappuzha, Ernakulam Jn., Aluva, Thrissur, Shoranur, Tirur, Kozhikode, Kannur, Kasaragod, Mangalore Jn., Udupi, Karwar, Madgaon, Thivim, Ratnagiri, Chiplun, Roha, Panvel, Vasai Road, Boisar, Vapi, Surat, Vadodara, Dahod, Ratlam, Nagda, Ujjain and Dewas. 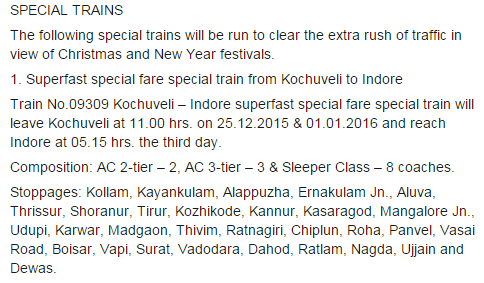 Advance reservations for the above trains will commence on 20.12.2015.